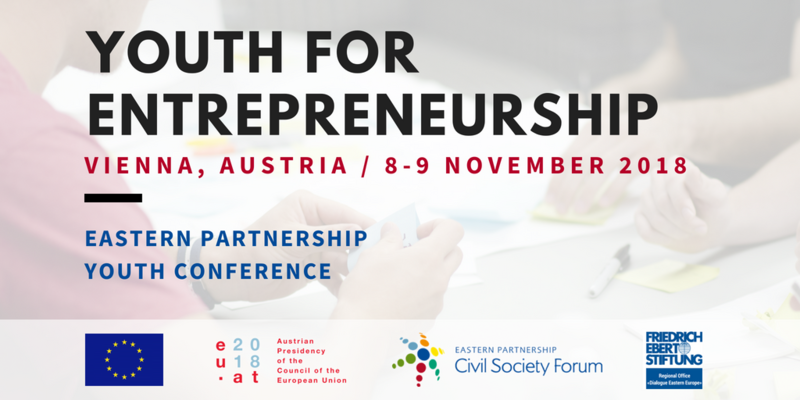 Held under the auspices of the Austrian Presidency of the Council of European Union, the second Eastern Partnership Youth Conference 2018: “Youth for Entrepreneurship” took place on 8-9 November 2018 in Vienna, Austria. Organised by Eastern Partnership Civil Society Forum (EaP CSF), the conference brought together 130 young activists and entrepreneurs from the Eastern Partnership countries, Russia, Turkey and the EU. Together with trainers, entrepreneurs and stakeholders from all over Europe, young entrepreneurs discussed and developed key competences that can help them to boost competitiveness and growth in their regions. The President of the Federal Republic of Austria, Dr. Alexander Van der Bellen greeted the participants of the conference in a video address, prepared for this special occasion. Following the address, Federal Minister for Women, Family and Youth of Austria, Ms. Juliane Bogner-Strauß spoke on the current state of youth entrepreneurship in Austria and the role of the state in supporting the development of social entrepreneurship. Moreover, Mr. Jeroen Willems, DG NEAR, European Commission elaborated on the possibilities of EU-EaP, Russia and Turkey cooperation and ways to support further youth social entrepreneurship initiatives. This was the second Eastern Partnership Youth Conference, organised by the Eastern Partnership Civil Society Forum (EaP CSF) and funded by DG NEAR, the Austrian Presidency of the Council of European Union, Friedrich-Ebert-Foundation Regional Office “Dialogue Eastern Europe” and Salto-Youth Eastern Europe and Caucasus Resource Centre. Devised and directed by the members of EaP CSF Working Group 4 “Contacts between People”, the main aim of the conference was to facilitate cooperation and contacts between the participants and to create stronger and trust-based links for the future. Through participation in the Eastern Partnership Youth Conference 2018: “Youth for Entrepreneurship”, young people had the possibility to discover strategies, methods and tools to cultivate entrepreneurial thinking and skills. Participants from the selected countries were equipped with essential entrepreneurial and business know-how to enable them to tackle community problems through quality youth work – which promotes self-employment and socially-minded, entrepreneurial culture. Thanks to input of experts working on social enterprises, these young people were introduced to functioning social enterprise models in the EU and Eastern Partnership countries – to be able to apply entrepreneurial approach in their own communities. While young people were working together with experts in various workshops, the EaP CSF team collected their thoughts and impressions on the conference. In a new format “Youth Kaleidoscope”, you can hear the voice of young people on the spot. Participants from different backgrounds and countries were asked three identical questions. Here you can listen to their answers! This opportunity is open to young people, between 18-30 – coming from the Eastern Partnership countries: Armenia, Azerbaijan, Belarus, Georgia, Moldova and Ukraine, as well as the European Union, Russia and Turkey, who are looking to start a social or business enterprise in their own, widely-defined communities. Applications will be reviewed on the formal selection criteria, as well as answers to the application questionnaire. Follow the updates on #YouthForEnterpreneurship!